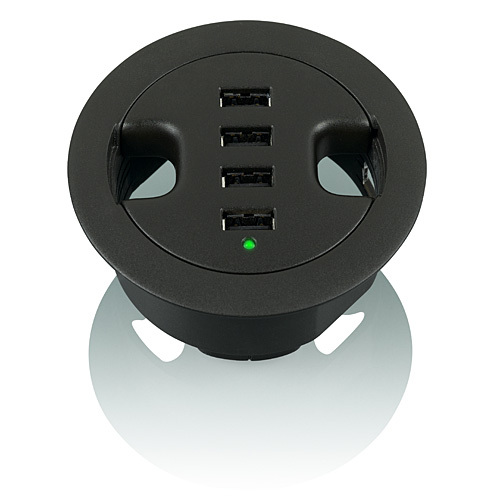 Belkin makes this great USB hub that fits into the grommet cut-outs present on much office furniture. Not familiar with a desk grommet - its a circular hole cut through the work surface that allows you to pass power and data cords for your desktop equipment. They are typically fitted with a plastic trim that often has a cover which leaves a smaller area for the cabling. Often the area needed by the cables is small, but the larger opening is needed to pass the cable ends and connectors. So Belkin has integrated a handy USB hub into the grommet cover. There are still two wire pass holes on either side, but now you don't need to have a USB hub on top of your desk. The cable to the computer plugs in underneath and now your USB accessories can just be plugged in to the grommet cover without groping under your desk for your CPU.